It is no secret that the Turks love to eat. The people of Turkey are lucky enough to have the perfect climate for growing delicious and fresh produce that can make it straight to the table from its source in the matter of a few hours, sometimes even minutes, making their meals healthy and scrumptious. Every meal time in Turkey is an event and can sometimes last for hours. For families and friends it is a time to sit back, relax and enjoy each other’s company while catching up on the latest gossip, and breakfast time is the perfect excuse to enjoy all of this while basking in the morning sun. Breakfast is the most important meal of the day. An intake of healthy and nutritious food within two hours of waking provides the body and brain with fuel, giving you energy and important nutrients and vitamins to set you up for the busy day ahead. Foreigners have come to understand the word ‘kahvaltı’ to mean breakfast, but its literal translation is ‘before coffee’. ‘Kahvaltı’ is the first meal of the day that you eat before consuming coffee. It is a buffet style meal, based on the very familiar scene of a gathering of mezes. Presentation is everything at a Turkish breakfast, meant to whet your appetite and leave you wanting to come back for more. ‘Kahvaltı’ really is the world’s breakfast of champions. 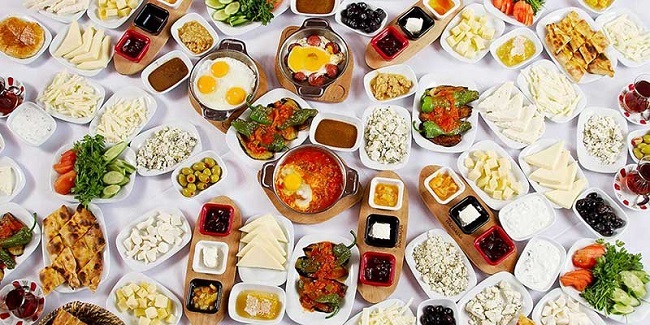 Even if you are not a morning person, in Turkey you will want to drag yourself out of bed for this celebration of food. There is nothing better than to sit on a beautiful patio veranda with a fantastic view and the sun shining on your face as you sip on Turkish çay and wait for your dozen or so dishes of fresh food to arrive. You will need to be sat at a big table because the feast that you are about to be presented with will be fit for a sultan. The çay will be plentiful and the wait won’t be long, but you should be prepared for the mountain of food that you will served. The basic elements of a Turkish breakfast no matter where in the country you are include bread, butter, jams and preserves, honey, olives, tomatoes, cucumbers, cheeses, yoghurt, fruit juices and lashings of Turkish tea. Most places across Turkey will accompany your meze style breakfast with a side order of eggs, either hard boiled, fried or as an omelette. 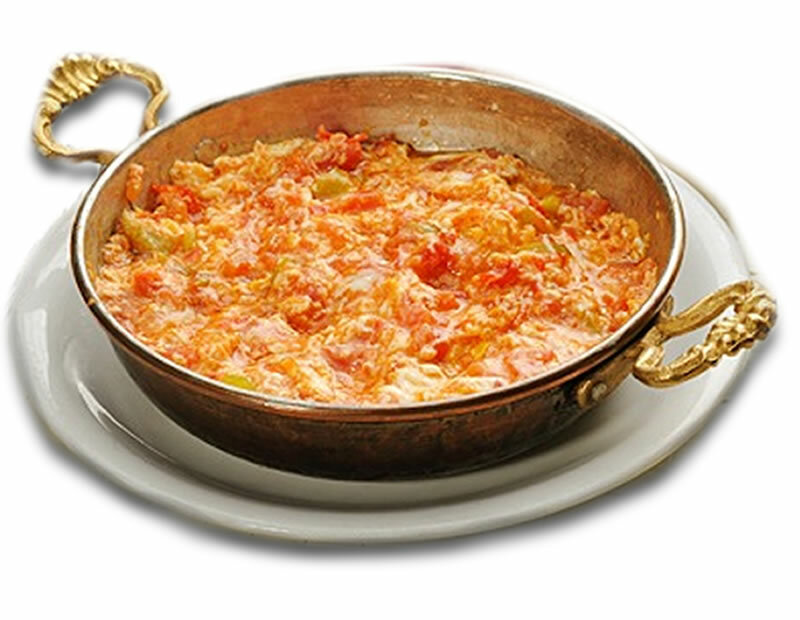 If you see ‘menemen’ on your menu, don’t even think twice, the Turkish scrambled egg is delicious, mixed with tomatoes, peppers and onions. On other occasions you may find a portion of ‘sucuk’, spicy sausages of ground meat, pork free of course, mixed with various spices like fenugreek, cumin, garlic, salt and red pepper. Savoury gözleme (somewhere between a pancake and a flatbread), pastries and ‘kavut’ (a roasted and crushed cereal flour mixed with milk like a porridge) may also make an appearance. In Turkey, breakfast is all about the freshness of ingredients. Whether they are shopping for their families or for guests or hotel visitors, a trip to the local market and bakeries is an absolute must as this is where the freshest locally produced ingredients can be found. Here they search for the best quality foods that they can find. They will buy the juiciest tomatoes and the plumpest olives from the market before heading to the local bakery for freshly baked bread and pastries like “börek”, cheese and herb filled filo, which could still be warm as they are served to you. Whatever is placed on your table, you can guarantee that the produce will be the best that they could find and most likely grown or produced within a few miles of where you are. Every region of Turkey has a variation on ‘kahvaltı’, from the freshly milled olive oil covered tomatoes and cucumbers of the Aegean and Mediterranean coastal villages, to the delicate and flaky pastries of Gaziantep, filled with cream, sprinkled with pistachios and known as ‘katmer’. You can even find a kebab for breakfast in Gaziantep and nearby Diyarbakir where liver can only be found on the breakfast menu. Another firm favourite of the spice loving east is ‘beyran çorbası’, a spicy lamb based breakfast soup which is said to ward off pneumonia. In the Black Sea region you can experience some of the most delicious butter in the world, from their well fed milch cows, but they are famous for a dish that has a different name in every city on the northeast coast. In the city of Trabzon it is known as ‘kuymak’ though you may also come across the names ‘mıhlama’ and yağlaş’. The dish is a blend of local cheeses, melted together with coarsely ground cornmeal, delicious scooped onto a piece of crusty bread. There are over 30 different types of cheeses to be found in Turkey and the variety depends on certain factors; cultural habits and tastes, natural conditions, the species and variety of the animals providing the milk and the production methods used to make the cheese. 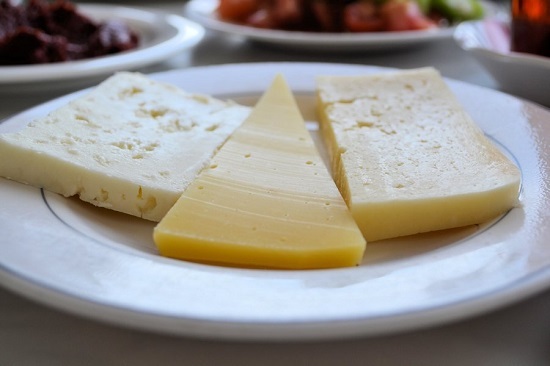 The standard cheese found at a Turkish breakfast is called ‘beyaz peynir’, a white sheep’s milk cheese which is full fat and creamy with a hint of saltiness. Other white cheeses are also popular, some from sheep’s milk and some from cow’s milk. The chosen milk is curdled, strained and then salted in brine before being tinned. 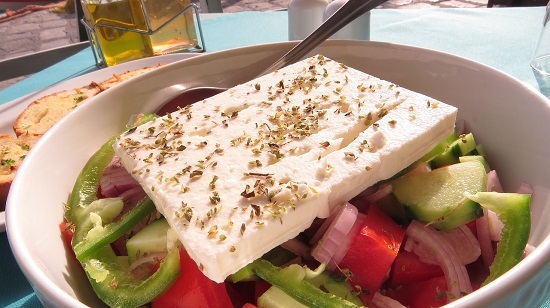 Mostly served on a dish at breakfast to enjoy with fresh tomatoes and cucumber, white cheese is also used in omelettes and pastries. 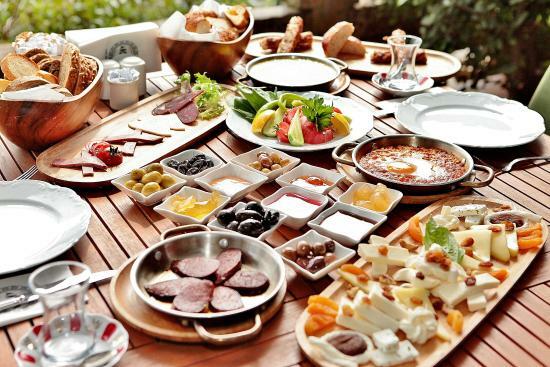 There are a few other Turkish cheeses which make their way to the breakfast table however. ‘Kaşar peyniri’ is also produced from either sheep’s or cow’s milk but is boiled in salt water after curdling, which gives it a dough like texture like mozzarella. ‘Tulum peyniri’ is more crumbly as the water is removed and is an aged cheese that can be very salty, often used in pastries too. ‘Dil peyniri’ is a string cheese made with cow’s milk, also boiled like ‘kaşar’, but while it is being boiled it is stretched and becomes stringier. Lastly, ‘mihaliç peyniri’, which is the most similar to ‘beyaz peynir’, is an aged sheep’s milk cheese whose curds are placed in hot water and then left to harden. The cheese usually comes in balls or slices and is characterised by its holes. Honey is a big deal in Turkey and at breakfast it can be added to everything and anything. You may add it to yoghurt or scoop it up with a piece of bread, you may even dip your cheese into it. There are dozens of varieties of honey to be found in Turkey and some demand an incredible amount of money! Honey competitions are held all over Turkey each year and recently Turkish honey became the focus of the International Honey Contest. The commission tasted honey from 28 producers across Turkey which included varieties such as flower honeys, forest honeys and chestnut honeys. They were examined for their colour, taste, smell and structure and they declared that there were diversities in varieties like no other country in the world. Pine honey is the most popular variety in Turkey, harvested in Muğla, Marmaris, Aydin, Kusadasi and the smaller towns of the Mediterranean region. The golden preservative is produced by honey bees that collect honeydew from a scale insect species which live on certain types of pine trees which are indigenous to that region. It has become a popular staple of breakfasts all over Turkey thanks to its rich, dark colour, reduced sweetness and the fact that it can be kept for longer than other varieties. The world’s most expensive honey is produced in Turkey, Elvish honey. This particular type of honey, which is worth way more than its weight in gold, is extracted from a 1,800 metre deep cave in the Saricayir valley of Artvin city in northeastern Turkey. The honey is naturally produced without hives and is incredibly mineral rich as the honey is harvested from the actual walls of the cave that it is found in. The first kilogram of Elvish honey was sold at the French stock exchange in 2009 for an eye watering €45,000. Today you can purchase a kilo for around €5,000. You are unlikely to find Elvish honey on your breakfast table in Turkey unless you are prepared to sell your car for it! One to watch out for in Turkey is the Black Sea region’s ‘Mad Honey’, given its name thanks to its reputation as a legal drug. 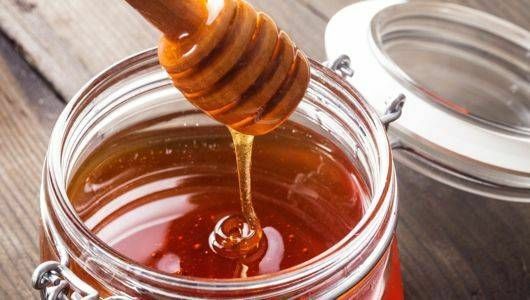 Although the hallucinogenic honey was originally found near the Black Sea, it is now being harvested in other areas of Turkey. To produce this honey, bees are using specific types of rhododendron flowers to collect nectar. Rhododendron lute and rhododendron ponticum each have a natural neurotoxin called grayanotoxin in their nectars. This ingredient gives the consumer a special kind of buzz when they eat the honey. If you're brave enough to try it on your morning yoghurt you will most likely experience a feeling of euphoria and possibly even hallucinations. The honey is expensive though at €200 per pound, and consuming too much can cause you to experience an overdoes with reactions such as sickness, loss of consciousness, seizures and can even be fatal. Just to give you an idea of how serious this is, Mad honey was used as a weapon in ancient times! 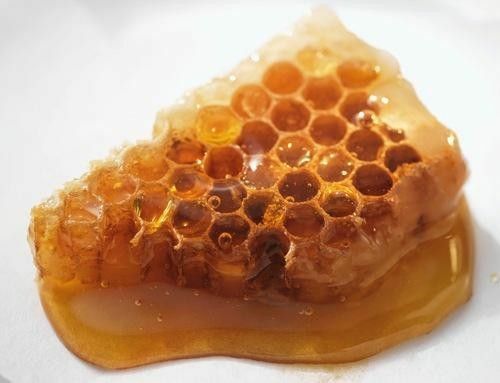 The honey is completely legal, however producers are more than aware of its side effects so you would be lucky to actually acquire some as a tourist. The city of Van is incredibly well known across Turkey as the place to go for the best breakfast in the world. In fact, Van even has a street dedicated to the first meal of the day, ‘Kahvaltı Caddesi’, meaning ‘Breakfast Street’, where you can find breakfast salons aplenty. The city actually seems to run on breakfast with some places only serving breakfast foods. Van’s iconic ‘kahvaltı’ includes a few exciting twists on the traditional Turkish breakfast. ‘Otlu peyniri’ is the most popular, a firm, off-white, salty block which blends local cheeses with wild herbs such as fennel, garlic shoots, thyme and mint that have been soaked in a salt brine before being added. 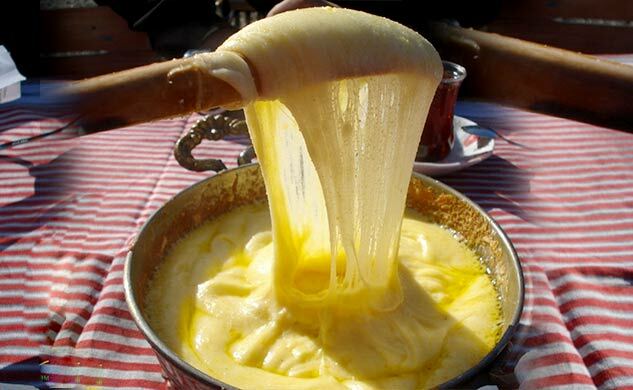 ‘Otlu peyniri’ is so popular that the city exports 5,000 tons of the cheese to other parts of Turkey every year. Sütçü Fevzi is a veteran restaurant of Breakfast Street, a breakfast here includes cucumber, tomatoes sprinkled with red pepper flakes, fresh local butter, cacik (chopped cucumber and parsley mixed with strained yoghurt), ‘otlu peyniri' and kaymak (a cheesy clotted cream) served with local honey, chopped walnuts and freshly baked flat bread. Two years ago, Van was put on the international map as the world’s breakfast capital when it broke the Guinness world record for the “World’s most crowded breakfast table”. A total of 51,793 people came together to enjoy breakfast in Van. 25,000 chairs were set up with 6,000 tables and those who couldn’t find a seat used tablecloths to sit on the ground. The previous record was held by the US with 18,941 people. If you happen to be in Istanbul, you are probably in the best place to enjoy a Turkish breakfast as every variety can be found in this eclectic city. Here are some of our favourites. Sütiş Emirgan - One of the best places to have breakfast in Istanbul, located on the banks of the Bosphorus in the district of Emrigan. Mangerie Bebek - Located in the Bebek neighbourhood overlooking the sea, often frequented by Turkish celebrities with a laid back atmosphere. Beşiktaş - This area of Istanbul has lots of establishments with a friendly setting where you can find ‘pişi’, a breakfast doughnut filled with cheese or chocolate. Van Kahvalti - One of the most popular breakfast places in Istanbul, located in the trendy Beyoğlu district. The owner is from Van, so you can sample a famous Van breakfast right here!